Zachary Horst and Angela Southern are the hosts of Letter People, a semi-regular Austin lettering meetup for letter-lovers to draw and mingle. They'll share their lettering work and backgrounds, talk about how they use lettering in their own professional work, then guide you through a collaborative hands-on mini workshop, on the theme of unity and voting, because the event falls on Election Day. Paper and writing materials provided although, you're more than welcome to bring any of your favorite lettering tools! Join us for a set of new lettering skills and walk away with new design friends, essential lettering skills, and several new lettering pieces. Photos of the final collaborative piece will be perfect for sharing on social media! Letter People is open to anyone interested in lettering. 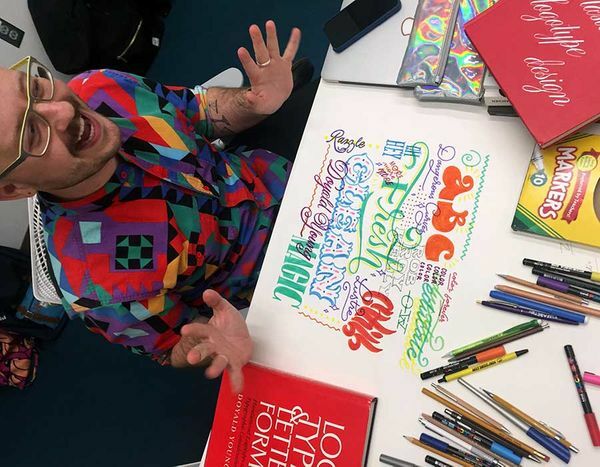 We have casual semi-monthly events, where we invite anyone to join us as we chat, draw lettering together, and build a lettering community in Austin.